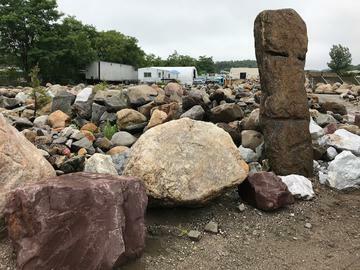 Our Stone Yard & Rock Quarry is a Landscape Stone - Rock - Boulder - Supply, on two acres of property at 2 Old Northport Road in Kings Park, Suffolk County, Long Island, New York 11754. We offer a large variety of Landscaping Materials : Landscape Rocks, Landscape Boulders, Landscape Stone, Landscape Gravel, Jetty Rock, Jetty Stone, Beach Erosion Stone, Gabion Stone, Granite Rock, Marble Rock, Limestone Rock, Round Rock, Angular Rock, River Rock, River Stone, Pool Rock,Waterfall Rock. Memorial Stones, or Granite Memorial Rocks which can be engraved or a plaque mounted. Many companies promote having big inventories of rocks, boulders, and stone, when in reality they can only show pictures and order products for you, as they are merely brokers. When you are told with their advertisements of vast selections in stock .... Just pull Google or Bing satellites down on their address before you spend your time going there. 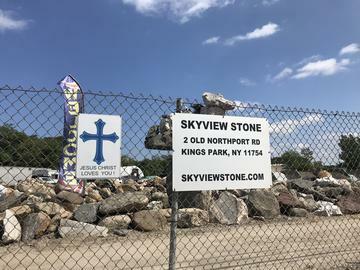 Skyview Stone is located at the North East corner of Old Northport Rd & Townline Rd, on 2 acre location, in Suffolk County, NY. Website pages are on links at top of page, just click on the page link you want to go to. Our page links used be on the left side of the page, but Google Mobile wanted links at the top so the mobile view would fit the phone screens. "If God is on our side, who can ever be against us ?" and close to truck we can set 10,000 lb rocks in place. Many textures, shapes, and sizes ... round, smooth, oval, and textured. 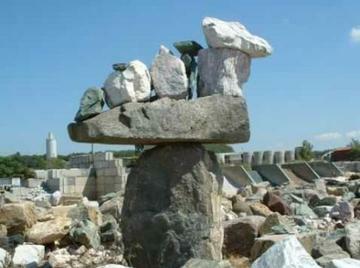 We supply colorful landscape stone and rock .... granite, shale and river rocks. All natural products for your Long Island landscaping supplies or home projects. Skyview Stone does not sell any imitation or artificial material. 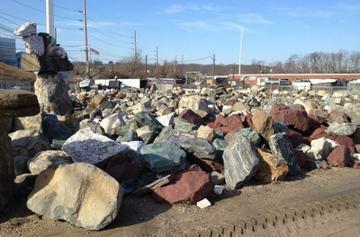 Landscaping Boulders come rounded, angular, blasted, smooth or rough, many different colors and sizes. In bad weather we close, so if the "forecast" is changing, just give us a call before you make the trip to us. Use "Google maps" searching for "Skyview Stone", or follow directions on our website directions page. Check, Cash, or Credit Cards accepted with 3.5% fee additional. If you travel a long distance, please stop in at 7-11, or Donkin Donuts, up in town, to use their facilities, as their is no bathroom facility to use at Skyview Stone Quarry location. Landscaping Supplies like Gravel and River Stones can be used in driveways, gardens and flowerbeds, walkways and pathways, patio and under decks. Give an enhanced look to court yards, Waterfalls, Ponds, Swimming Pools, Lakes, and Playgrounds. Use larger landscaping boulders in a park, or to give your monument some character with quality that will last forever. Add a beautiful natural decorative look with colorful gravel or white sand. 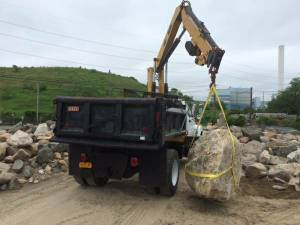 Long Island Landscaping Boulders are awesome for a natural country look, or choose bright colored rock & stone for a more contemporary look. Large Rock Cutting and Rock Setting, we can have done for you. Pick out the rock you want and tell us what you need cut into the rock, or cut off the rock. We will use our crane boom truck to set the rocks at your location. How about building a shower waterfall attached to your swimming pool ? Rock Engraving we can have done for you ! Memorial Stone Engraving and Plaques. Stone, Gravel, Rock or Boulders : granite to shale, landscaping, seawalls, or memorial rocks, we supply earth friendly, low maintenance ground cover materials for your property in Suffolk, Nassau, Queens, NY City. Build yourself a tranquil outdoor setting in your backyard garden. Boulders can be used for birdbaths, benches to lounge and read or wait for the bus, and Dive Rocks to give your Pool and enhanced look. Create a relaxing butterfly garden with butterfly bushes or flowers and use our gravel to make it maintenance free. Whatever your dream. Skyview Stone will be there to help you bring your dream into reality! We deliver to Nassau County and Sufflok County, as well as Queens County, Kings County, Manhattan, NY. We thank you for visiting our website and remember, whether you are a homeowner or landscape professional, an expert or a beginner, Skyview Stone can help you achieve the natural accent you're looking for. Let us know how we can be of Service to you ! Our Question & Answers Page may be of help to you. Please stop by to see products you are interested in which are in stock, as pictures on site will not always be exact, as products change in color and size do to being natural, as inventory is replaced. Adirondack River Kobbles are 5" to 10" in size. 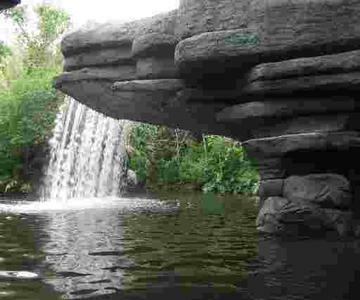 This larger River Stone can be used as borders or in walls, or around your pond and waterfall. DIFFERENT COLOR, SHAPE, and SIZE, ROCK FROM 5 DIFFERENT STATES, including LONG ISLAND BOULDERS. We deliver landscape boulders, rock and stone, as well as jetty stone to Suffolk County, Nassau County, Queens, Brooklyn, Bronx, Manhattan, NY City, Westchester, Staten Island, Great Neck, Glen Cove, Brookville, Muttontown, Lloyd Harbor, Sans Point, Port Washington, Cold Spring Harbor, Stony Brook, Dix Hills, Babylon, West Islip, Lake Grove, E. Hampton, and others. Or you can bring a truck or trailer and we will load you. We do not sell bricks, cut veneer stone, countertops, pavers, or bluestone treads. Big Rocks or Small Rocks.....You pick out your special rocks, and we will put the rock almost anywhere you want it with a crane, depending on rock size and distance from where truck can be parked. Need a Plaque made or just mounted on it ?....Maybe have something Engraved into ther rock.....? Let us know...Come on over and see the rocks displays ! With our boom truck we can set rocks up to 25 feet from the truck on your property. Up close to truck we can lift 10,000 lbs, 25 feet from truck we can lift 2200 lbs. Let us know where you want rocks placed, either as landscape design, property borders, or car barriers, on your property. 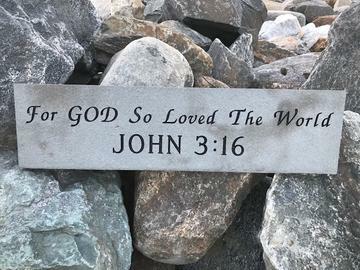 Please visit our Memorials page, as we sell Memorial Rocks and Memorial Stones to Nassau, Suffolk, Manhattan, for plaques to be mounted on, or to be engraved with your design or picture! Boulders for sale, Buy boulders here, We sell boulders. Stop by, view our instock landscaping supplies, take a look around, there is a map on our Directions page. When you're ready to purchase, Roger will assure you get the right product for your project. If you're not able to stop in, feel free to contact him at 631-544-1038, Kings Park, Suffolk County, Long Island, NY. Thank you for visiting our website. We appreciate you stopping by to take a look and hope that this has been a helpful experience for you. If we are working with other customers, please leave us a message and we will return your call ! What two bodies of water did Jehovah / God part for Moses and Joshua ?